and we must bid a final "Farewell" to our faithful, little friend Cyrus. How he changed our lives! and soon, by his absence they will change again. His loving memory will be all that we have left to comfort us. "Who was Cyrus?" you may ask. Quite simply, he was what all of us strive to be in our own human lives. 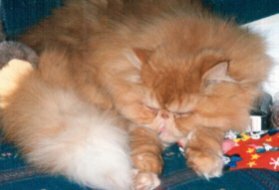 Cyrus was a persian cat who spent the first three years of his life in the show ring. His conformation and appearance were admired by all who saw him. Next was his ability to trust. "I love you" and "I want to be with you". Cyrus has been afflicted by a genetic liver disease for the past six years. Persians who develop this do not live but for a short time after diagnosis. and appreciate who he was to us. where he could no longer enjoy every moment that life had given him. Lastly, was his unconditional and eternal love. This is what we will miss the most. and the gentle sounds that he made as he lie in bed with us. and the love of our hearts. Dear God, please let there be an after-life for of all your creatures. For we do not know how we can bear eternity without our little Cyrus. rest in peace as you now wait for us to cross over and be with you again.